Commodore 64 advert from 1980 featuring the Elephant Boxing. The Commodore 64 is an 8-bit home computer introduced by Commodore International in January 1982. Volume production started in the spring of 1982, with machines being released on to the market in August at a price of US $595. Preceded by the Commodore VIC-20 and Commodore MAX Machine, the C64 features 64 kilobytes (65,536 bytes) of memory with sound and graphics performance that were superior to IBM-compatible computers of that time. It is commonly known as the C64 or C=64 (after the graphic logo on the case) and occasionally as the CBM 64 (for Commodore Business Machines), or VIC-64. It has also been affectionately nicknamed the “breadbox” and “bullnose” due to the shape and colour of the first version of its casing. Part of its success was because it was sold in retail stores instead of electronics stores, and also because these machines can be directly plugged into an existing home television without any modifications. Commodore produced many of its parts in-house to control supplies and cost. It is sometimes compared to the Ford Model-T auto-mobile for bringing a new technology to middle-class households via creative mass-production. Approximately 10,000 commercial software titles were made for the Commodore 64 including development tools, office applications, and games. Various C64 emulators allow anyone with a modern computer, or a compatible game console, to run these programs today. The machine is also credited with popularizing the computer demo scene. 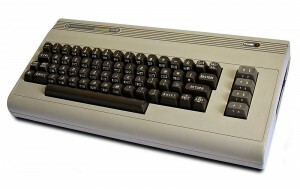 The C64 is still used today by some computer hobbyists. Since 28 March 2008, Commodore 64 games have been available to buy through Nintendo’s Virtual Console service in Europe; the first games available were Uridium and International Karate. Later, on February 23, 2009, the Commodore 64 section was launched in North America with the first three titles, International Karate, The Last Ninja and Pitstop II. A C64 emulator application with classic games also appears on Apple Inc.’s App Store.